Gear up for intense challenges only Hot Wheels can deliver! 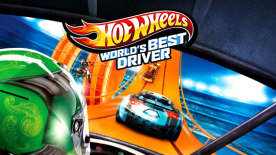 Join the ranks of Team Hot Wheels, an elite group of drivers competing for the coveted title: “World’s Best Driver.” The drivers are split into four teams, each with their own disciplines: Super Fast (Green), Outrageous (Red), High-Tech (Blue) and Powerful (Yellow). Compete in thrilling events across four Hot Wheels Test Facility (HWTF) locations around the world. For the first time, Hot Wheels fans can experience the legendary world of HWTF where the latest and greatest Hot Wheels creations are born. Pick your team, choose your ride and GO FOR IT! Adrenaline-fueled driving only Hot Wheels can deliver! Distributed by Warner Bros. Home Entertainment Inc. WB GAMES LOGO, WB SHIELD: ™ & © Warner Bros. Entertainment Inc. ©2013 Mattel. All Rights Reserved. Developed by Firebrand Games and Entertainment Ltd. © 2013. Firebrand, Octane and their related logos are trademarks and/or registered trademarks of Firebrand Game and Entertainment Ltd. All other trademarks and trade names are the properties of their respective owner.